Kold Katcher heating unit technology offers a cost effective way to lower volatility of produced light crude oil through a system of heating, and agitating at the production tank in preparation for loading at the rail terminal. The design of the system incorporates a number of added advantages. Explosion proof, flameless infrared heater technology. Proprietary ASME rated heat exchanger design. Exchanger design creates turbulent flow as oil enters the heat exchanger greatly increasing heat uptake. Turbulating diffuser design encourages natural gas liquids (NGL’s) to separate from crude oil. 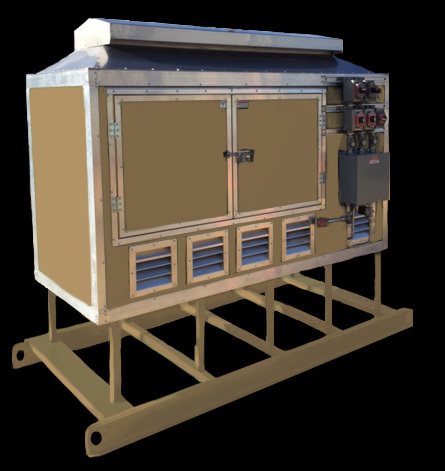 The system incorporates a mag-drive pump which eliminates any seals or packing leaks, reducing maintenance. Safe, simple, and easy operation.